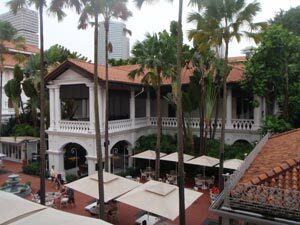 It is a 20-hour flight from Sydney to Istanbul, so we decided to break it up with a short stopover in Singapore to visit my sister, Helen, and her husband, Wayne, who are teaching there. It was a pleasant couple of days catching up with them, despite the sudden jump from morning frosts to tropical heat and humidity. 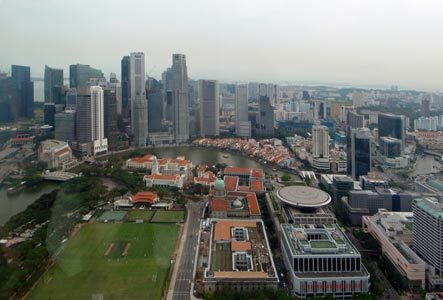 We last visited Singapore 20 years ago, but it is a different place now - even the coastline has moved, as land is reclaimed from the sea and developed. We visited the new parts as well as old parts not visited before, popping up like moles from one of the world's most efficient metro systems, partook of an obligatory drink at the long bar of Raffles, and spent a day exploring the white sand beaches and myriad amusements of Sentosa Island, self-styled as Asia's best playground. 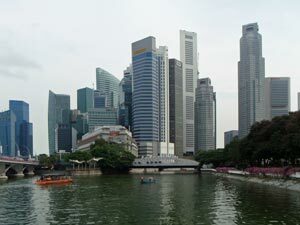 It was a very brief insight into life in Singapore, but the main purpose of our trip lay head, so in the early hours of a hot Asian night, we took off again bound for Istanbul. Thanks, Helen and Wayne, for looking after us so well. 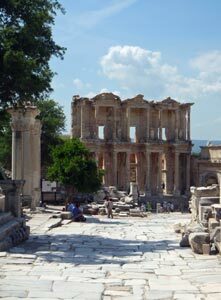 Before starting the trekking part of our trip, we indulged in a little "normal" tourism by visiting some of the must-see destinations - Istanbul, Ephesus and Pamukkale. 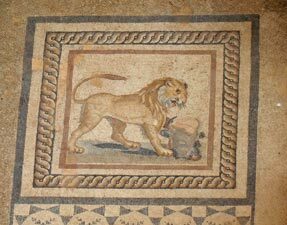 I don't propose to go into a lot of detail about them, as this is essentially a walking website, but the images here should give an idea of why they are virtually compulsory parts of any trip to Turkey. 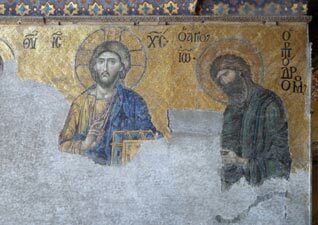 After a 12-hour flight and 6-hour time shift, coupled with our early morning arrival, the fair Nello and I were feeling a bit jet-lagged on our first day in Turkey. 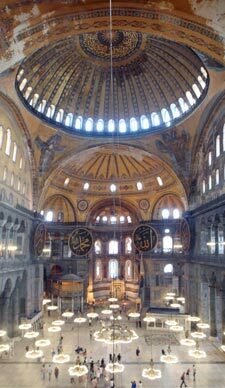 The best way to treat jet-lag is activity, so after checking in to our comfortable hostel, we wandered off down the cobbled streets of old Istanbul to seek out the glories of empires past, namely the architectural gems of the Byzantine and Ottoman Empires. 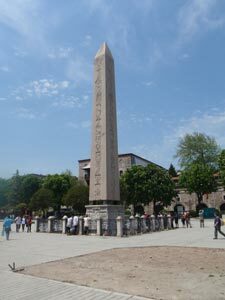 Passing through Meydani Square, site of the old Roman hippodrome, we admired the 3000 year-old Egyptian Obelisk, pilfered by the Byzantine emperor in 390AD. 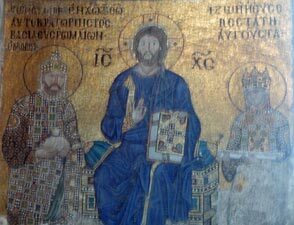 Joining the tourist throngs, we explored the wonders of the Aya Sofia, for 1000 years a church, for 500 years a mosque and for 25 years a museum. 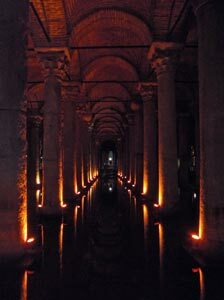 We then descended into the bowels of old Constantinople to marvel at the engineering feat of the Byzantine cisterns, built in the 6th century to store water for the ancient city and its inhabitants. 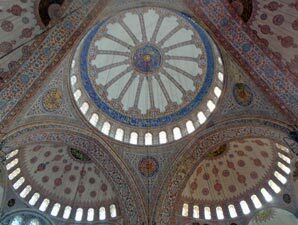 Finally, we visited the 17th century Blue Mosque, a marvel of Ottoman architecture with its fine minarets, nested domes and exquisitely painted interior - for us the highlight of our brief time in Istanbul. After an early night and good sleep, we were a bit brighter the next day and took on the challenge of wandering through the alleyways of the Grand Bazaar to hone our skills at carpet-purchase-avoidance (we were actually surprised that the bazaar was more hassle-free than expected). 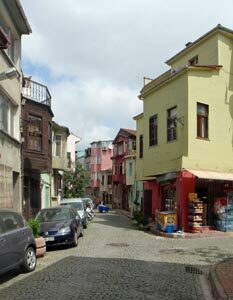 Descending through the mayhem of a busy morning in the shops of the old part of the city, we checked out the spice bazaar where we made our only big purchase - 2 liras worth of Turkish Delight! 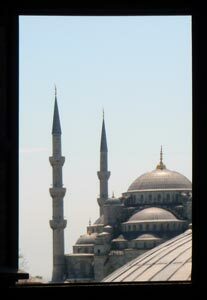 From here we wandered over the bridge across the Golden Horn, lined with fisherman who were catching bucket-loads of what appeared to be large sardines, to climb up to the 15th century Galata Tower for a grand panorama of the city and the Bosphorus. 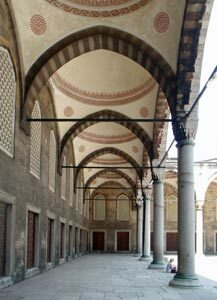 A visit to the Topkapi Palace finished the day and the huge crowds of Turkish school children and foreign tourists milling through its many rooms almost finished me - I was starting to dream of the walks ahead in peaceful forests and mountains. 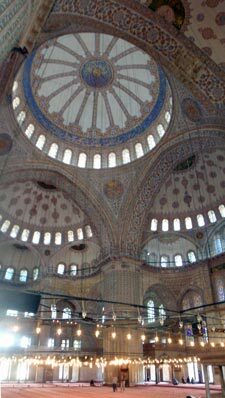 It was time to leave Istanbul and head on - we had enjoyed the rich cultural history that permeates this place, but we can only take big cities in very small doses. 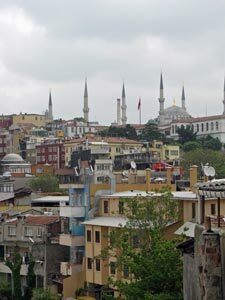 We spent a pleasant last morning in Istanbul, sitting on the terrace of our hostel and watching the procession of cargo ships gliding slowly out of the Bosphorus and into the Sea of Marmara - with a grey sky merging into the still grey water, they almost seemed suspended in the void. 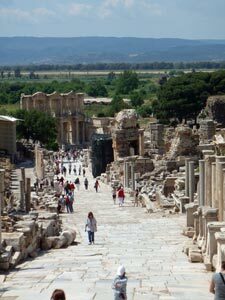 Our turn was next, so we headed down to the terminal to catch the fast ferry across the Sea of Marmara to Bandirma and, from there, a slow but pleasant 5-hour train trip across the spring-green Turkish countryside to Izmir and on to Selçuk. 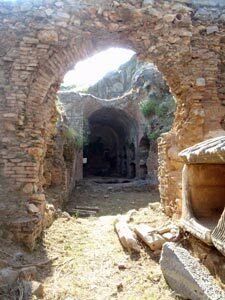 We had left Europe, if not Turkey, and were about to explore even more ancient civilisations - the ruins of the city of Ephesus. 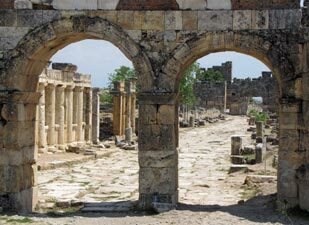 The rural town of Selçuk is the gateway to Ephesus, unless of course you are on a great big cruise ship and have been bussed in droves from Kusadasi for a been-there-done-that experience. 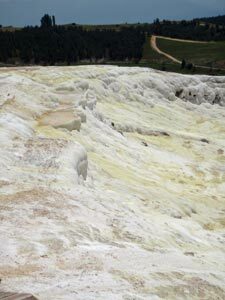 It is a pleasant town and, with accommodation like ANZ Guesthouse, Boomerang Guesthouse, Wallaby Hostel and Canberra Hotel, the Australian visitor at least will feel at home. 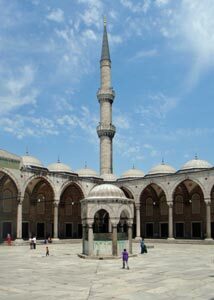 It seems that many repat Turks have come back with fond memories of Australia and strong Australian accents to set up businesses. 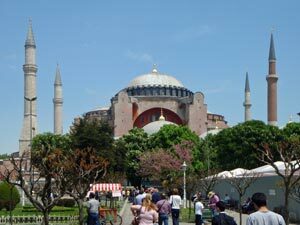 After the big city bustle of Istanbul, we did feel at home here. 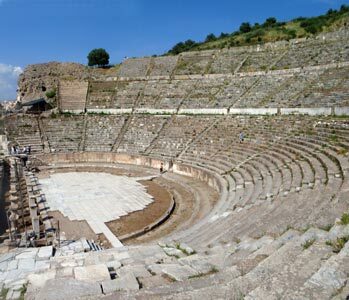 We spent an interesting few hours wandering amongst the crumbling edifices of ancient Ephesus, founded 3000 years ago by the Greeks, ruled by the Persians, expanded by the Romans into the greatest city of Anatolia, fought over by the Byzantines and Turks and finally brought down by nature itself, as its port silted up and left it without a purpose. 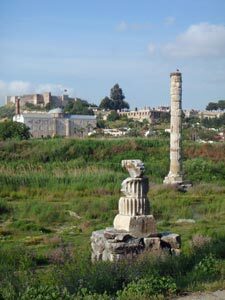 It was well worth a visit and, as we walked back from the ruins of the city to Selçuk, we stopped at the site of the Temple of Artemis, once one of the seven wonders of the world, now with only one of its 126 pillars remaining in a boggy field. 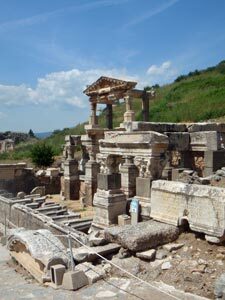 Ephesus is a monument to the glory of ancient civilisations and the ultimate futility of human striving for immortality. 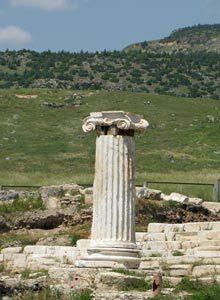 The stork's nest on the top of that single remaining pillar said it all. 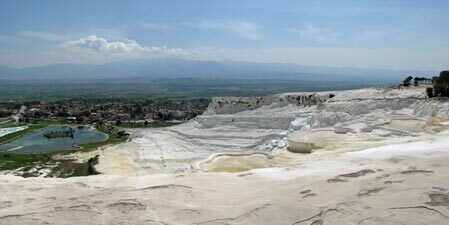 The following day was a long trip from Selçuk to Antalya, via several buses large and small. 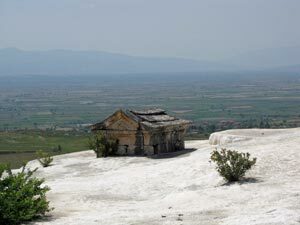 We headed off from Selçuk, up the rich flats of the Meander Valley, past orchards, vegetable crops and strawberry fields, and through towns where every roof supported a cluster of solar water heaters and satellite dishes. 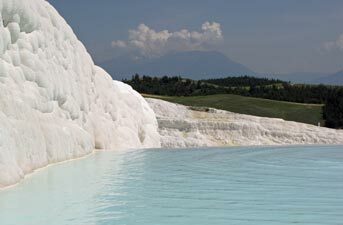 Our destination was Pamukkale, for a 4-hour stopover to visit the famous calcified travertine steps and nearby ruins of the ancient Greek city of Hieropolis. 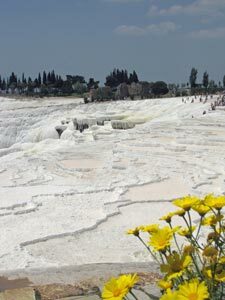 The city was built around the spring which feeds the shallow pools of the travertine steps of Pamukkale and its waters are acclaimed as a cure for many ills. 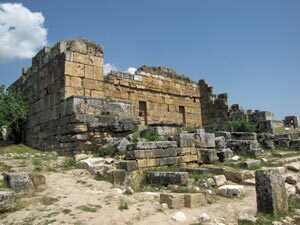 The original spa, known as Cleopatra's Pool, opened for business in the 2nd century BC and is still open. 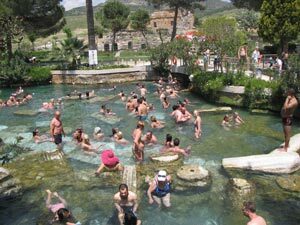 The Russians have discovered it and the pool was full of tourists soaking in the mineral-rich waters. 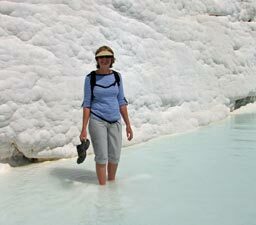 Even more were splashing about the pale blue pools in snow white formations of calcium carbonate that flow down the hillside - it was easy to see why this place was named Pamukkale, the "cotton castle", but also easy to see that it was a victim of its own fame. 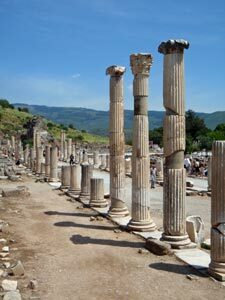 Mass tourism has diminished its appeal. 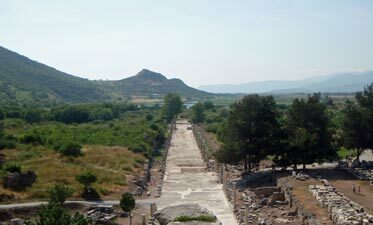 After wandering through the ruins of Hieropolis, the fair Nello and I removed sandals and followed the crowds down the long white road, wading from pool to pool to the base of the hill. It will be interesting to see if the waters help my ankle, which still frequently swells up after breaking it five months ago - I hope so, in the next few weeks we have some serious walking to do. 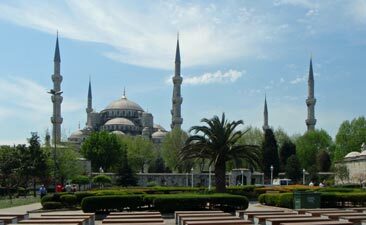 It was almost midnight by the time we checked in to our hostel in Antalya after a long but satisfying day - our days of classic tourism were over and tomorrow we would be heading off for our first trekking adventure in Turkey. I confess to small flutter of excitement.